Smear Clear (SybronEndo, Orange, CA, USA) is a recently introduced chelating agent that contains 17% EDTA solution with two additional proprietary surfactants. In regards to SmearClear, all the studies that have evaluated this product have used it for 1 minute as per according to the manufacturer's instructions. There has not been much research to evaluate the effect of increasing the duration of application on its ability to remove the intracanal smear layer. The present in-vitro study is an attempt to compare the efficacy of SmearClear, 17% EDTA solution and to evaluate the influence of their duration of application on the removal of intracanal smear layer. Seventy-two extracted non-carious human permanent maxillary incisors were selected for this study. These teeth were collected from different dental clinics in Belgaum, Karnataka, India. All teeth were extracted for periodontal reasons and were grouped irrespective of patient's gender, age or race, whether they were from the right or left side. Central incisors and lateral incisors were included in the study. Teeth with straight and single patent root canal and without any anatomical variations, no visible root caries and no signs of external or internal resorption and with completely formed apices were used in the study. Following extraction, teeth were cleaned by removing the remaining soft tissue and then stored in 0.1% thymol solution (Loba Chemicals, India) at room temperature. Before utilization, teeth were taken out and washed under tap water to remove the traces of thymol solution. Each tooth was numbered on the buccal and palatal surfaces of the root. Endodontic access was obtained and a size 15 K-file (Kendo, VDW, Germany) was introduced into the root canal until the tip was just visible at the apical foramen. The working length (WL) for preparation of the canal was determined by deducting 1mm from the length recorded when the file was visible at the apex. Root apices were covered with sticky wax to create closed end canal model that more accurately simulates in-vivo situations by creating vapor-lock effect. All teeth were prepared with ProTaper Nickel-Titanium rotary instruments (Dentsply Maillefer, Switzerland) up to apical size F5 (ISO size 50). During instrumentation, canals were irrigated with 1 ml of 1% sodium hypochlorite (Vishal Dentocare, Ahmedabad, India), between every instrument change using a 27-gauge needle. All the teeth were instrumented by a single operator to avoid the inter-operator bias. Following irrigation, the canals were dried with sterile absorbent paper points (Dentsply Maillefer, Ballaigues, Switzerland) and the entrance to each of the canals were protected with a cotton pellet to prevent penetration of the dentinal debris into the canals during de-coronation. Using diamond discs with water, the crown was removed at Cemento-enamel junction (CEJ) and deep grooves were made on the buccal and palatal surfaces of the roots without perforating the canal. The roots were then split longitudinally using a chisel. One-half of each root was selected for examination under scanning electron microscope (Cambridge, Sterioscan 360, Cambridge, UK). Attributed scores were tabulated and submitted to statistical analysis. The data obtained were analyzed with the kappa test to determine concordance among the examiners. Mann-Whitney U test and Kruskal-Wallis were used to compare the groups at 5% level of signiﬁcance. Intra-examiner and inter-examiner reliabilities were verified using the kappa test, significance set at 0.5, which showed satisfactory value of 0.87 [Table 1]. Since the kappa test showed satisfactory inter-examiner reliability, only the values of the first examiner were considered for the statistical analysis. The mean with standard deviation of smear scores of the three groups at 6 mm and 2 mm is shown in [Table 2] and [Table 3], respectively. At 6 mm level, significant difference was found between Groups A1 with both A2 and A3, using the post-hoc analysis. But no significant difference found between groups A2 and A3. Also, significant difference was found between Groups B1 with both B2 and B3, whereas no significant difference between groups B2 and B3. At 2 mm level, significant difference was found between Groups A1 and A3, using the post-hoc analysis. But no significant difference was found between groups A1 and A2 or A2 and A3. Further, significant difference was found between Groups B1 and B3, whereas no significant difference was found between groups B1 and B2 or B2 and B3. The present in-vitro study was designed to evaluate the effect of addition of surfactants and the effect of duration of application of final irrigating solution in removing the intracanal smear layer. Sodium hypochlorite is the most widely used chemical solution in the biomechanical preparation of root canal system. However, despite its excellent antimicrobial activity and capacity of dissolving organic materials, this solution alone does not effectively remove the smear layer. , The association of EDTA and NaOCl solutions has proved effective in removing smear layer. EDTA acts upon the inorganic components of the smear layer, causes the decalcification of peri-tubular and inter-tubular dentine, and leaves the collagen exposed. Subsequently, the use of NaOCl dissolves the collagen, leaving the entrances to the dentinal tubules more open and exposed. Goldman et al.,  and Yamada et al.,  found that the use of a high volume final flush with 17% EDTA followed by NaOCl effectively removed the smear layer. The findings of the present study showed that Smear Clear and EDTA had similar performance in smear layer removal from the middle third of the root canal. But, in the apical third Smear Clear showed significantly better smear layer removal compared to 17% EDTA solution. Surface tension may be defined as the force between molecules that produces a tendency for the surface area of the liquid to decrease. This force tends to inhibit the spread of a liquid over a surface or limit its ability to penetrate a capillary tube. Reducing surface tension of endodontic solutions improves their dentin-wetting ability  and improves their flow into narrow root canals,  which might be the probable reason for the better smear layer removal from the apical area in the Smear Clear group in our study. Variation in the duration of application of the final irrigating solutions may also have an effect on its ability to remove the smear layer. Numerous studies have been conducted in regards to this, showing conflicting results. An in-vitro study,  evaluated the effect of ethylenediamine tetra-acetic acid plus Cetavion (EDTAC) after 5, 15 and 30 minutes and concluded that the effect of EDTAC could be seen after 5 minutes but the strongest effect was detected at 15 min with no variations after 30 minutes. In contrast, Yamada et al.,  reported a few seconds of EDTA administration is sufficient. Meryon et al.,  reported that the smear layer was completely removed with 10% EDTA for 1 min, resulting in increased orifice size. Cergneux et al.,  also reported similar findings when 15% EDTA that was applied in root canal for 4 minutes. Calt and Serper  compared the effects of 17% EDTA on smear layer removal and on the structure of dentin, after 1 and 10 minutes of application. Their results showed that 1 minute EDTA irrigation is effective in removing the smear layer whereas a 10 minute application caused excessive peritubular and intertubular dentinal erosion. Another in-vitro study,  evaluated the influence of irrigation time of 1, 3 and 5 minutes with 15% EDTA and 1% NaOCl on intracanal smear layer removal. Their results showed that although no significant difference existed but the time of 1 minute proved insufficient in cleaning the apical third. The longer application time of EDTA and NaOCl produced the best results in the apical third. In respect to the application time of Smear Clear, all the studies ,,, that have evaluated this product have used it for 1 minute as per according the manufacturer's instructions. There has not been much research to evaluate the effect of increasing the application time of Smear Clear on its smear removal efficacy. In the present study, in general, the ability of EDTA and Smear Clear to remove the smear layer was enhanced as the duration of application of the irrigating solution increased. In both the experimental groups, (17% EDTA and Smear Clear) the variation with time was different according to the different levels of root canal. At 6 mm level (middle third), the amount of smear layer on the dentinal walls decreased significantly as the time was increased from 1 minute to 3 minutes, but no statistically significant difference was seen between 3 and 5 minutes duration. On the other hand, at 2 mm level (apical third), the amount of smear layer on the dentinal walls decreased significantly as the time duration increased from 1 minute to 5 minutes. But no statistically significant difference was seen between 1 and 3 minutes or 3 and 5 minutes. As far as it could be ascertained in the literature, Smear Clear has been evaluated in four in-vitro studies ,,, with permanent teeth. The first study,  compared the efficacy of different root canal irrigants (NaOCl, Smear Clear, 2% chlorhexidine, REDTA and BioPure MTAD) against Enterococcus fecalis biofilm. The authors found that Smear Clear had greater efficacy than chlorhexidine, REDTA and MTAD. These results may be attributed to the fact that Smear Clear has cetrimide in its composition, which is a quaternary ammonium compound and a cationic detergent that is effective against Gram-positive and Gram-negative microorganisms. However, the other three studies, ,, concluded that Smear Clear was effective in removing the smear layer, but no significant difference was found between Smear Clear and EDTA. Although, the scoring method involved qualitative analysis, the use of a simple and direct scoring system, as proposed by Rome et al.,  by multiple calibrated examiners with concordance between them (kappa test), as well as the large number of observations made in the present study, clearly increase the reliability of the results. There are other scoring systems for smear layer as proposed by Torabinejad et al.,  Hulsmann et al.,  and Mayer et al.,  but the elaborate criteria could have compromised the quantitative analysis of the smear layer. Torabinejad et al. described the following smear layer scoring criteria: 0, no smear layer, no smear layer on the root canal surface, with all the tubules clean and open; 1, moderate smear layer; 2, heavy smear layer, smear layer covers the root canal surface and the tubules. Hulsmann et al., gave a ﬁve-score smear layer scoring criteria: (1) score 1: No smear layer, and all dentinal tubules were open; (2) score 2: A small amount of smear layer, and some dentinal tubules were open; (3) score 3: Homogenous smear layer covering the root canal wall, and only a few dentinal tubules open; (4) score 4: Complete root canal wall covered by a homogeneous smear layer, and no open dentinal tubules were observed; and (5) score 5: Heavy, homogeneous smear layer covering the complete root canal wall. The results of the present study showed that Smear Clear is an effective root canal irrigant for the removal of intracanal smear layer. S. Anitha Rao and N Manasa  observed similar findings and suggested that Smear Clear and citric acid performed better than EDTA and NaOCl in calcium hydroxide removal in both coronal and apical grooves. The results of our study are in contradiction to the study done by Nelson-Filho P, Leite Gde A et al.,  da Silva LA, Sanguino AC  et al., who suggested that Smear Clear was able to remove the smear layer from the root canals of primary and permanent teeth, similarly as 14.3% EDTA. Andrabi SM, Kumar AN et al.,  have demonstrated enhanced activity of Smear Clear when manual dynamic activation was done. Nevertheless, these in-vitro results cannot be extrapolated completely to in-vivo situations. Hence, further research is required and more in-vivo studies need to be done to evaluate this product. The final irrigation protocol of 17% EDTA solution or Smear Clear followed by 1% NaOCl proved to be effective in removing the smear layer for all durations of applications (1, 3 and 5 minutes). However, as the duration of application of the irrigating solution increased from 1 to 5 minutes, its efficacy to remove the smear layer was also enhanced. The authors deny any conflicts of interest. The authors would like to thank Mr. Gurulingam, Indian Institute of Science, Bangalore for technical assistance and Mr. Dhareshwar for assistance in statistical analysis. Mader CL, Baumgartner JC, Peters DD. Scanning electron microscopic investigation of the smeared layer on root canal walls. J Endod 1984;10:477-83. Lui JN, Kuah HG, Chen NN. Effects of EDTA with and without surfactants or ultrasonics on removal of smear layer. J Endod 2007;33:472-5. Berutti E, Marini R, Angeretti A. Penetration ability of different irrigants into dentinal tubules. J Endod 1997;23:725-7. Örstavik D, Haapasalo M. Disinfection by endodontic irrigants and dressings of experimentally infected dentinal tubules. Endod Dent Traumatol 1990;6:142-9. White RR, Goldman M, Lin PS. The influence of the smeared layer upon dentinal tubule penetration by endodontic filling materials. Part II. J Endod 1987;13:369-74. Oksan T, Aktener BO, Sen BH, Tezel H. The penetration of root canal sealers into dentinal tubules. A scanning electron microscopic study. Int Endod J 1993;26:301-5. 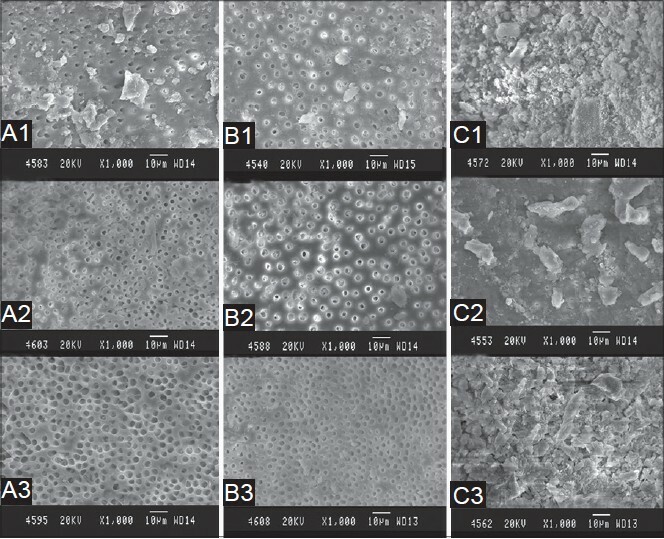 Economides N, Liolios E, Kolokuris I, Beltes P. Long-term evaluation of the influence of smear layer removal on the sealing ability of different sealers. J Endod 1999;25:123-5. Kennedy WA, Walker WA 3 rd , Gough RW. Smear layer removal effects on apical leakage. J Endod 1986;12:21-7. Saunders WP, Saunders EM. The effect of smear layer upon the coronal leakage of gutta-percha fillings and a glass ionomer sealer. Int Endod J 1992;25:245-9. Drake DR, Wiemann AH, Rivera EM, Walton RE. Bacterial retention in canal walls in vitro: Effect of smear layer. J Endod 1994;20:78-82. Garberoglio R, Becce C. Smear layer removal by root canal irrigants. A comparative scanning electron microscopic study. Oral Surg Oral Med Oral Pathol 1994;78:359-67. Goldberg F, Spielberg C. The effect of EDTAC and the variation of its working time analyzed with scanning electron microscopy. Oral Surg Oral Med Oral Pathol 1982;53:74-7. Rome WJ, Doran JE, Walker WA 3 rd . The effectiveness of gly-Oxide and sodium hypochlorite in preventing smear layer formation. J Endod 1985;11:281-8.
da Silva LA, Sanguino AC, Rocha CT, Leonardo MR, Silva RA. Scanning electron microscopic preliminary study of the efficacy of SmearClear and EDTA for smear layer removal after root canal instrumentation in permanent teeth. J Endod 2008;34:1541-4. Pérez-Heredia M, Ferrer-Luque CM, González-Rodríguez MP. The effectiveness of different acid irrigating solutions in root canal cleaning after hand and rotary instrumentation. J Endod 2006;32:993-7. Texeira CS, Fellipe MC, Felippe WT. Effect of Application time of EDTA and sodium hypochlorite on intracanal smear layer removal-SEM analysis. Int Endod J 2005;38:285-90. Goldman M, Goldman LB, Cavaleri R, Bogis J, Lin PS. The efficacy of several endodontic irrigating solutions: a scanning electron microscopic study: Part 2. J Endod 1982;8:487-92. Yamada RS, Armas A, Goldman M, Lin PS. A scanning electron microscopic comparison of a high volume final flush with several irrigating solutions: Part 3. J Endod 1983;9:137-42. Dunavant TR, Regan JD, Glickman GN, Solomon ES, Honeyman AL. Comparative evaluation of endodontic irrigants against Enterococcus faecalis biofilms. J Endod 2006;32:527-31. Goldman LB, Goldman M, Kronman JH, Lin PS. The efficacy of several irrigating solutions for endodontics: A scanning electron microscopic study. Oral Surg Oral Med Oral Pathol 1981;52:197-204. Abbott PV, Heijkoop PS, Cardaci SC, Hume WR, Heithersay GS. An SEM study of the effects of different irrigation sequences and ultrasonics. Int Endod J 1991;24:308-16. Khedmat S, Shokouhinejad N. Comparison of the efficacy of three chelating agents in smear layer removal. J Endod 2008;34:599-602. Glantz PO, Hansson L. Wetting of dentin by some root canal medicaments. Odontol Revy 1972;23:205-10. Abou-Rass M, Patonai FJ Jr. The effects of decreasing surface tension on the flow of irrigating solutions in narrow root canals. Oral Surg Oral Med Oral Pathol 1982;53:524-6. Meryon SD, Tobias RS, Jakeman KJ. Smear removal agents: A quantitative study in vivo and in vitro. J Prosthet Dent 1987;20:174-9. Cergneux M, Ciucchi B, Dietschi JM, Holz J. The influence of the smear layer on the sealing ability of canal obturation. Int Endod J 1987;20:228-32. Khademi A, Feizianfard M. The effect of EDTA and citric acid on smear layer removal of mesial canals of first mandibular molars: A scanning electron microscopic study. Res Med Sci J 2004;9:80-8. Hulsmann M, Rummelin C, Schafers F. Root canal cleanliness after preparation with different endodontic handpieces and hand instruments: A comparative SEM investigation. J Endod 1997;23:301-6. Mayer BE, Peters OA, Barbakow F. Effects of rotary instruments and ultrasonic irrigation on debris and smear layer scores: A scanning electron microscopic study. Int Endod J 2002;35:582-9. Anitha Rao S, Manasa N. Effect of irrigants using ultrasonics on intracanal calcium hydroxide removal-an in vitro comparative evaluation. Braz J Oral Sci 2012;11:52-5. Nelson- Filho P, Leite Gde A, Fernanades PM, da Silva RA, Rueda JC. Efficacy of SmearClear and ethylenediaminetetraacetic acid for smear layer removal in primary teeth. J Dent Child (Chic) 2009;76:74-7. 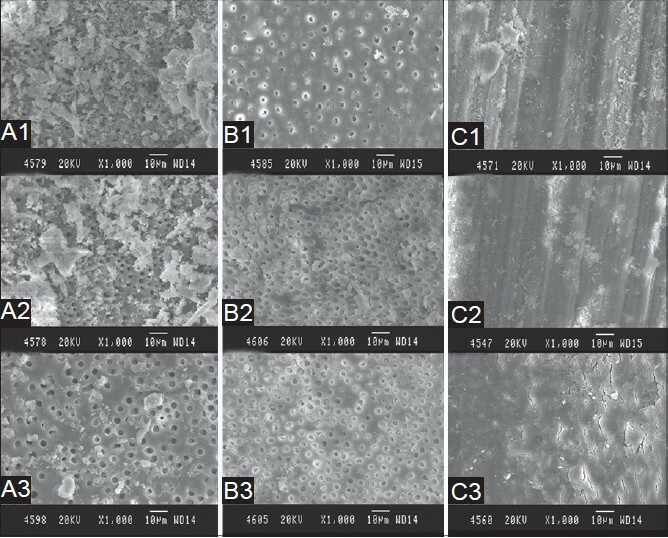 Andrabi SM, Kumar A, Mishra SK, Tewari RK, Alam S, Siddiqui S. Effect of manual dynamic activation on smear layer removal efficacy of ethylenediaminetetraacetic acid and SmearClear: An in vitro scanning electron microscopic study. Aust Endod J 2013;39:131-6.